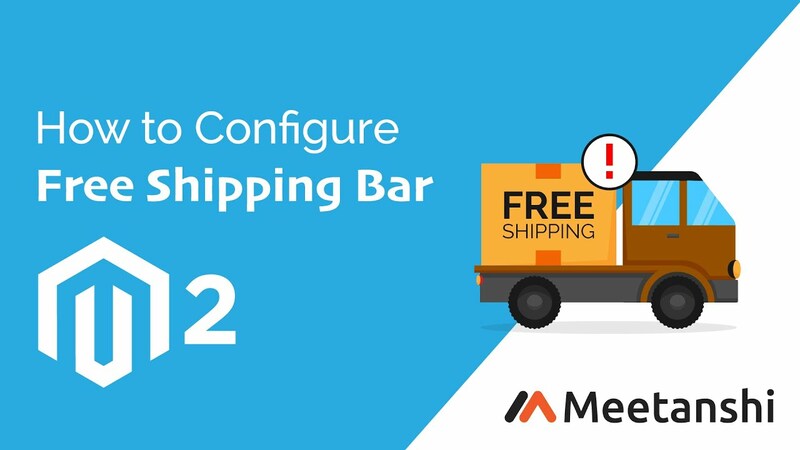 Magento 2 Free Shipping Bar extension by Meetanshi allows to create and display free shipping bar to increase average cart value and drive more purchases from users to avail free shipping. Automates price calculation process to reach free shipping goal. Customize free shipping bar using various fonts and colors. "Gaining an extra dollar with additional purchase is no harm!" It is a common observation that customers find it hard to spend money on the shipping service while shopping online. Taking the benefit of such an attitude, there is a marketing strategy in disguise that store owners implement to boost their sales in which, they offer free shipping on a specific cart total. The customers are thus encouraged to buy more in order to increase the cart total and avail free shipping! Meetanshi has developed Magento 2 Free Shipping Bar extension for Magento 2 stores to promote additional purchases by creating a free shipping notifier based on the cart total. For example, the module displays "Add more $20 to be eligible for Free Shipping!". Such a message encourages a buyer to buy a product worth $20 to skip the shipping charges and in exchange have a useful product for himself! The module automates the calculation of cart total and the amount needed to qualify for free shipping. As per the changes in the cart, the calculations will be updated and displayed in the frontend. With the Magento 2 Free Shipping Bar from Meetanshi, admin can customize the position and color of the bar as well as customize the message displayed to make it catch the attention of users. Enable/disable the extension from the backend. Persuade customers to buy additional items in the lure of free shipping service. Set the threshold value of the cart total to qualify for free shipping, select groups to enable free shipping bar for and add customized text to be displayed in the frontend. Replace the free shipping notifier bar with a customized success message once the customer's cart is eligible for free shipping. Admin can allow customers to close the shipping bar. Select to display the shipping bar either in mobile or desktop or both. You can also set the delay time to load the free shipping bar after specific seconds of the page load. Allows customizing the color, alignment, and font of the free shipping bar and the success message. You can also add custom CSS. The team is pleasure to work with! Loved this feature rich extension.